The primary roles of the Joint Base Cape Cod (JBCC) Executive Director are to ensure inter-agency communication and coordination and government and community stakeholders are informed and engaged. Likewise, several of the JBCC military commands are considering basing additional missions at JBCC as well as looking at the efficiencies that might be gained through consolidation and cost-sharing of some Base Operating Support expenses. These and other initiatives have to be closely coordinated to ensure that expansion does not stress base infrastructure, utility capacity, etc. Along with the opportunity to pursue strategic mission plans for the JBCC comes the responsibility to do so in a coordinated manner that is efficient and effective, supportive of national security objectives, beneficial to the Cape Cod economy and, above all, respectful of the fragile environment of the Upper Cape. To ensure that this endeavor is carried out in an organized and cohesive manner, the Adjutant General has established the position of Executive Director, Joint Base Cape Cod (JBCC) (MANG) to oversee the effort. The following paragraphs will explain the need, define the benefits of this position to the JBCC’s many stakeholders, and underscore the importance of the position in the JBCC’s future transition as a truly joint installation. The major transformation steps outlined in the JBCC Joint Installation Partnership Agreement in the era of post-BRAC 2005 are underway. The Commonwealth, National Guard Bureau and Department of Homeland Security have made a long-term commitment to a military presence on the JBCC and it is imperative that the Massachusetts National Guard (MA NG) pursue opportunities that ensure future mission relevance and cost-effective infrastructure utilization of this training area. On a parallel track, a roadmap for the establishment of a homeland defense training center at JBCC has been briefed to interested parties with much support. With these diverse opportunities providing a stable foundation for the transformation effort at the JBCC, the future can be relatively secure. These proposals will become reality through a well-developed joint strategic plan/master plan that provides a coordinated approach to execution. This strategic plan and comprehensive master plan will emphasize and strengthen the role, necessity for, and the span of control to be exercised by an executive director. The presence of numerous non-MA NG tenants on the JBCC has, at times, made inter-agency coordination challenging due to a variety of interests. In these tough economic times every public entity must assess its future to ensure that it remains relevant. This requires a coordinated approach across the base since any uncoordinated change to a tenant’s structure or operation could have a detrimental effect on military operations and training. Despite the lack of a singular command structure on the JBCC, the public views all JBCC activities (and their potential external effects) in a cumulative fashion. Coordinated inter-agency communication internally at the JBCC will ensure efficient and comprehensive external communication with the Cape community and key stakeholder groups concerning a wide range of JBCC-related issues. The presences of several military organizations from multiple services on the JBCC establish it as the only joint base in the Commonwealth. Each organization is operationally responsible for the execution of its current wartime mission, which can present coordination challenges. 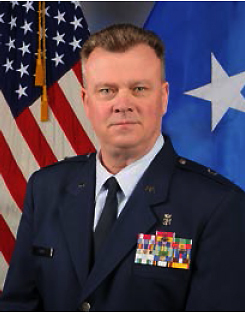 The executive director is the Adjutant General’s representative to the Joint Oversight Group (JOG). This body was established out of the Joint Installation Partnership Agreement in 2006 in the aftermath of BRAC 2005. The executive director will provide stability and continuity as a primary coordinator of these responsibilities, and will assist with the successful execution of these vital tasks in defense of the homeland. With the current and future emphasis on jointness, not only within the National Guard but also with other military services such as the Coast Guard, it is a must that the MA NG and non-MA NG missions at the JBCC be conducted in a joint fashion and that future endeavors be pursued in a like manner, however, executing jointly can be challenging. The presence of an executive director will focus the MA NG and non-MA NG plans for the JBCC and make the prospects for the future more successful and more synergistic. The Adjutant General of Massachusetts has underscored the Mass National Guard’s commitment to be good neighbors and good stewards of the JBCC’s environment. The JBCC executive director will ensure that everyone’s current and future missions comply with that mandate. It is important that our interaction with our community reinforce our status as good neighbors and good stewards of the environment. The formation of the Military Civilian Community Council (MCCC) was a significant step in ensuring that the lines of communication about JBCC endeavors are always open and that any new initiatives will foster mutually beneficial outcomes for both civilian and military communities. The executive director, like the JOG, will play a key role as a member of the MCCC. In an effort to meet the public’s need for a single point of contact to which they might address their questions or concerns; the executive director of the JBCC will fulfill this requirement on a daily basis as well as acting as the MCCC Chair, supported by the Environmental and Readiness Center. The MA NG is currently working out the final details of an update to the 2005 Joint Land Use Study for the JBCC. The executive director of the JBCC will play a vital role as part of the policy committee for endeavors such as a JLUS and coordinating between the military commands and local planners. The naming of an executive director provides the governor and other state officials a responsible party to ensure the successful, coherent and compliant development of the JBCC. Further, the executive director of the JBCC would act as the primary liaison with entities like Mass Development to further efforts in achieving efficiencies in Base Operations across the commands, utility operations, and compatible military and non-military development in the cantonment area. The position of executive director will provide for a state focal point for the questions that arise as we move forward. The executive director will also play a key role in supporting the Lt. Governor’s Military Asset and Security Strategy Task Force helping to secure the military bases of the Commonwealth. As mentioned previously, the executive director would act as the Adjutant General’s representative to the JBCCs Joint Oversight Group that was born out of the 2006 Joint Installation Partnership Agreement. An appointment to this group further establishes the position’s importance as an equal partner on the JBCC.